Today we continue our Holiday Gift Guide, our way to help you find the perfect gift for the animal lover on your list. All of these items are offered by our Conservation Partners, and purchasing the items in this guide helps these organizations continue the work they do. Today, let us turn our attention to a couple of items for the little animal lovers on your list. 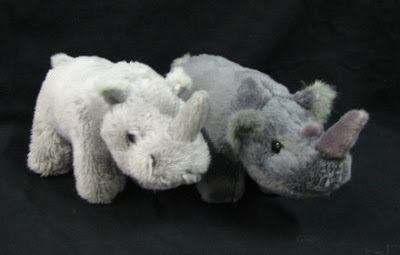 If you just happen to know a child who loves animals, specifically rhinos, these cuddly toys offered by Save the Rhino make a perfect gift or even a stocking stuffer. They are available in white or black and they are only about $10. Speaking of terrific plush toys, this one pictured above is from the Dian Fossey Gorilla Fund. 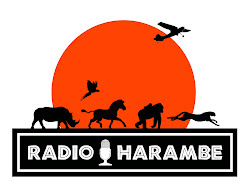 “Armstrong the Gorilla” is cute as could be, and we all know the struggles gorillas face in the wild. These are only $10 each and the kids in my family would be just as thrilled to know their gift helped save these animals as they would be with the doll itself. Finally, how about something for the little ones. Would you like to see your infant be a baby “conservation warrior”? 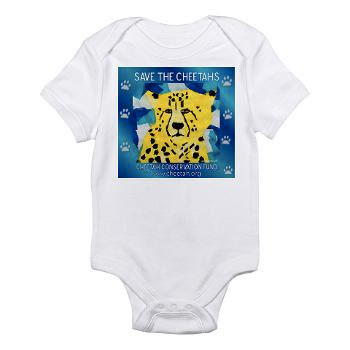 Well, this onesy offered by the Cheetah Conservation Fund will allow your munchkin to spread the word about helping to save the planet fastest land mammal. And how cute can you be??? So, please do what you can to help our wildlife and by getting a few great holiday gifts while also helping them is great idea. If you want to learn more about our Conservation Partners and they work they do, head to the Jambo Everyone Conservation Effort.